Ojeda filed his 2020 bid Sunday with the Federal Election Commission. Democrat Richard Ojeda may have lost his bid for Congress in West Virginia's 3rd Congressional District but the man who's been called "JFK with tattoos and a bench press" still has plans to run -- for president. "In the last 19 months while running for office in southern West Virginia, we received countless phone calls, e-mails, and messages from people all across the United States of America that educated me that the problems we have in southern West Virginia are the same problems that we have in the Southside of Chicago, in Flint, Michigan, in the Bronx, New York, the Rio Grande Valley and believe it not even places like Silicon Valley," Ojeda, who has the tattooed the names of his fellow service members who died in action on his body, said while announcing his presidential plans live on the Veterans Day holiday standing in front of the Korean War Veterans Memorial. He also introduced the "first pillar" of his platform -- fighting corruption in Washington and calling for a cap on the amount of money elected officials can make in office and collect once they retire. In his announcement, Ojeda called for people elected to federal office or serving in the Cabinet to sacrifice any net worth over $1 million to a charity of their choice. Ojeda said he plans to roll out his platform over the coming weeks. "We have elected officials who say they're going to run for office to serve the people. But in reality, they legislate themselves into wealth. They go into office and after one, two, terms they're worth millions upon millions of dollars, and that has to stop," Ojeda said. Ojeda plans to hold his first event as a presidential candidate on November 19 in Louisville, Kentucky. It's a long-shot bid for the White House from one of the most colorful candidates of the 2018 election. Ojeda campaigned across the coalfields of Southern West Virginia and won support from the left and right for his brash, outspoken style. Ojeda thinks his ability to connect to working class people will help him stand out in an already crowded Democratic 2020 field. "I ran in the reddest state of the United States of America. I turned almost 35 percent of the people that voted for Donald Trump back to voting for a Democrat," Ojeda, who lost his congressional bid to Republican Carol Miller by nearly 13 points last week, said Monday. "Let me tell you something, we can do this. I think that I relate to the people far more than what the president can ever relate to these people. The very people that he comes down to West Virginia and stands in front of could never afford one single round of golf in some of his fancy country clubs, he added. The Democrat also defended his vote for Donald Trump in the 2016 election, saying that he was the only candidate who came to West Virginia and spoke to the economic concerns of the state's citizens. "I was not happy with the things that Donald Trump was saying. But once again we're talking about being from the coal fields of West Virginia. I look around and I saw my family, my friends, the people that I loved struggling greatly. The coal industry in West Virginia when it is down people can't buy cars, people can't eat in restaurants, everything suffers," Ojeda said. 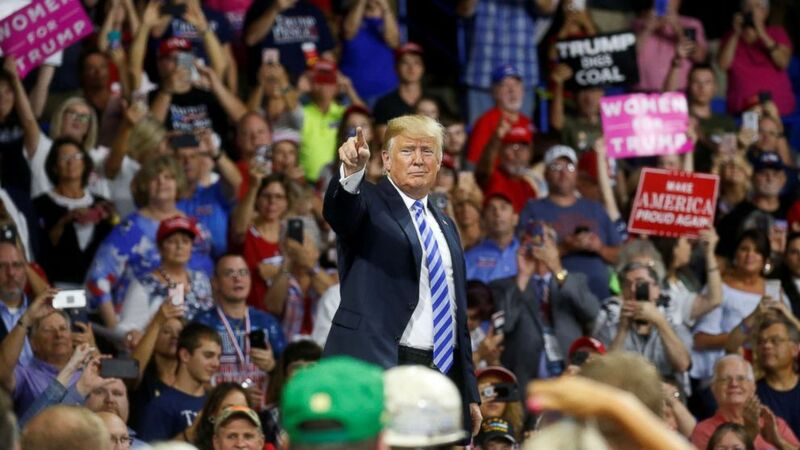 Trump, who has called Ojeda "stone cold crazy," remains popular in West Virginia's third district, an area considered the heart of Trump country. Ojeda's campaign said they saw a large enough swing for him that they feel he could be the working class voice to counter the president. Ojeda has used Trump's critiques of him at rallies in the state as a battle cry for his campaign. "If I'm stone-cold crazy because I have a hard time going to sleep at night because we have kids that go to bed hungry, then I'll be stone-cold crazy, and I'm OK with that," Ojeda told ABC News.